Even for those beaders that are fond of beaded beads, when we think of bead weaving, it tends to be pieces or components that stand alone. 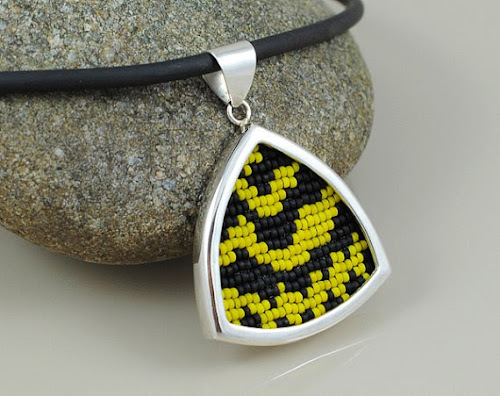 Given the versatility of seed beads, it’s no surprise that they can go almost anywhere in jewelry design. 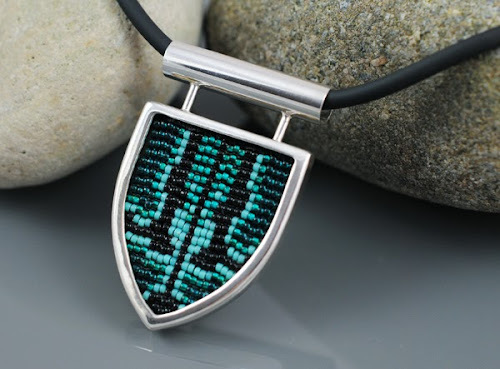 Jessee J. Smith, the artist behind Silverspot Metalworks, incorporates beautiful loom woven beadwork with handmade silver bezels with gorgeous results. Inspirational Beading: How did you first get into jewelry design? Jessee: I can’t remember a time when I wasn’t interested in jewelry, but I think the ancient Egyptians had a lot to do with it. From the time I was about six years old, I remember going to the library with my mom and making a beeline for the mythology section, and I was fascinated by mummies and ancient Egyptian life. Naturally, books on Egypt included lots of pictures of incredible jewelry, including beaded broad collars and mummy shrouds. I also became interested in Native American art when I visited the Alabama-Coushatta reservation with my grandfather, where I saw a boy my own age (around 7 years old) performing a modern, powwow-style fancy dance. I was captivated by his lavish regalia, especially his blue and white feather bustles, and my first thought was “I want to make an outfit like that!” As soon as we got home from Texas, I checked out a copy of W. Ben Hunt’s The Complete How-To Book of Indiancraft, which included a very detailed overview of how to make a fully beaded Lakota-style vest in lane stitch. The vest was a bit much to tackle, but it wasn’t long before I got some beads and started making small jewelry projects. Inspirational Beading: Do you remember your first design? Where is it today? Jessee: The very first beaded project I remember that involved more than simple stringing was a bracelet I made for my mom out of plastic pony beads in several shades of blue. I must have been about eight at the time. I was trying to come up with a more innovative way of putting the beads together than just stringing them, so I played around with thread and two needles until I made what I now know is a bead ladder. My mom seemed delighted with it (she’s a good mom! ), and for all I know, she may still have it. I’m not sure if that really counts as a “design,” but it was the first beaded thing that I remember being proud of. The first true beadwork design that I came up with on my own was a loom-woven bracelet (my first loom-woven project) that was a variation on a Greek key pattern in black, silver, and iridescent, transparent blue and green. I made a lot of bad newbie choices (like using regular poly/cotton sewing thread and those cheap painted silver beads that lose their coating over time), but that project was enough to get me hooked. I think I still have it stashed in a box somewhere. 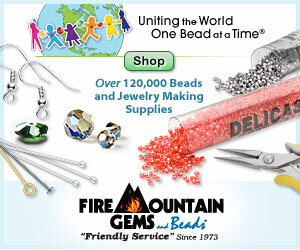 Inspirational Beading: Do you have a favorite kind of bead or jewelry component? Jessee: I love (and hoard like a dragon) very tiny seed beads, size 16/o and under, many of which were made before the twentieth century. I have a good collection of 20/o seed beads, but the only finished design I’ve made with them is the Burmese Python earrings that were featured in 500 Earrings. The tiny size of the beads allows for very high resolution in loom-woven or off-loom designs, and the old glass colors are beautiful and subtle. They do have their limitations: you can only weave them with the finest thread (I used Monocord 000) and size 16 needles, and even then, you must do a lot of culling. That, and blue microbeads are very hard to find, so your color choices are limited. Jessee: A lot of my work, in both beads and other media, stems from what is known in NeoConfucian Chinese philosophy as “Li.” Li can be thought of as the underlying force that brings order and structure to nature, and it is expressed in such things as the shapes of clouds, the branching of trees, and fractal patterns. The expressions of Li that hold the most fascination for me are the spot and stripe patterns found on living things. Everyone is familiar with the beautiful spots of the big cats, but fewer people take note of the equally spectacular patterns on mollusks, reptiles, insects, or even plants. 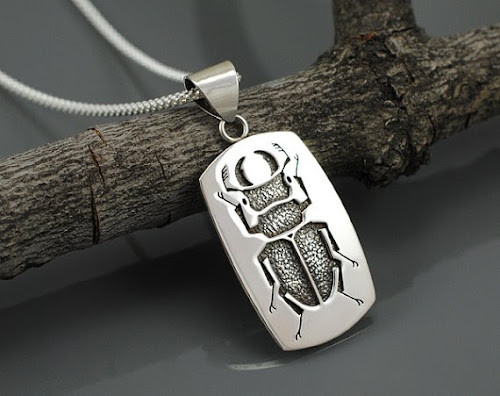 My husband is an entomologist and we work together on many research projects, so naturally a lot of inspiration comes from the endless variety of insects. Inspirational Beading: What was the inspiration behind your favorite design? Jessee: It would be hard to choose a single favorite beadwork design, but one of the projects that I was most satisfied with was a loom-woven panel that I made for a friend of mine based on his photograph of a ghost tiger beetle (Cicindela lepida). This little beetle (about 8 – 10 mm long) lives only on areas of white sand, emerging in the late afternoon to hunt for ants and other small prey. Its head, underside, and legs are deep copper, while the wing covers are a delicate ivory. My friend’s photo was so detailed that you could actually see the folded wings where they overlapped beneath the slightly translucent wing covers, and the sparkle from the individual grains of sand the beetle was standing on. Capturing the effect of translucency was a challenge, and I think I used about 12 shades and finishes of white, ivory, and pale tan in the beaded panel. The sand was fun, too—I used quite a few colors there, including a transparent glass bead with tan lining for the sparkly grains. Alas, I didn’t get a photo of the panel before I gifted it to my friend! He has it hanging in his study in Edmonton, Alberta, so I’ll have to get him to take one for me. 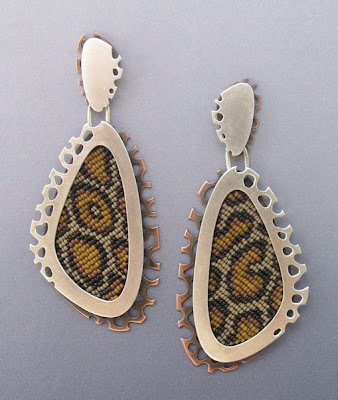 Inspirational Beading: Is there a material or subject that you would love to work with, but haven’t tried yet? Jessee: I work with many different media, so there’s always something new I want to try. In terms of beadwork, I tend to stick primarily to seed beads, but I would like to try new things with them. I would particularly like to try making some sculptural pieces, perhaps using welded steel frames that would allow me to make airy structures with light shining through the beaded panels. (The danger there is that they could end up just looking like fancy lampshades.) I’m also interested in the sort of 3D project that involves covering an existing object with beadwork; on a visit to Mexico City, I was lucky enough to see a VW Beetle completely covered in beadwork by Huichol artists, and it was one of the most mind-blowing things I’ve ever seen. I would love to do something that impactful someday. Jessee: That’s almost like choosing a favorite song—too hard to pick just one! I love all shades of green because of its connotation of life and growing things and nature, and I also like the challenge of finding good, earthy colors ranging through ivory to tan and light brown (I have a lot of use for those colors in my nature-derived designs). However, the color that makes me most cheerful is bright, bright orange. I have a few designs based on orange insects (like the Bella Moth), and for some, I even use neon orange fly-tying thread to bump up the color. My favorite color of seed beads are some bright orange transparent 14/o that I “mattified” with glass etching solution. They’re just delicious! Jessee: I would hope that anyone could find something to relate to in my designs, but the kind of person I would really expect it to resonate with is someone who has an interest in the natural world, and who finds satisfaction in the tiny details of the world around us. 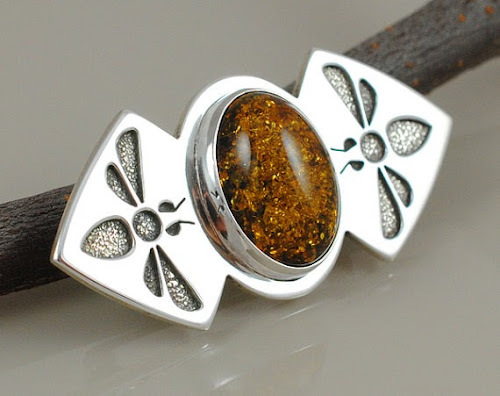 I also strive to make my jewelry as well-wrought as possible, with a very solid feel, so I think that the physical connection between the wearer and the jewelry will appeal to people who enjoy craft for its own sake, and the simple pleasure of a well-made object. You can see more of Jessee’s jewelry designs in her Etsy shop, and get the latest updates from Silverspot Metalworks on Facebook. This page includes affiliate links. Actions you take can result in a commission for Inspirational Beading. Thank you so much to everyone who joined in last week's seed bead giveaway from The Best Beads! We had a great turnout, and as always your answers and ideas for the favorite beads question were varied and inspiring. Random.org selected the winning comment, and the prize pack goes to Lucy - congratulations! Lucy's favorite bead picks included flowers, leaves, and peacock finish. 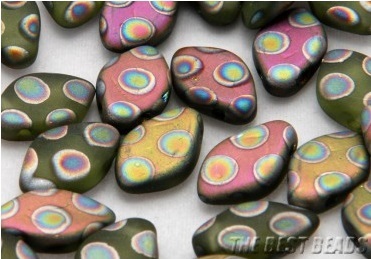 These are definitely some irresistible examples of fantastic Czech glass. They bring a lot of texture and cheerfulness to a design, whether its stringing or beadweaving. Many thanks to The Best Beads, and Inspirational Beading readers! Ever since entering a UFO necklace in the last Ugly Necklace Contest, I’ve found that it’s much easier to let go of designs that aren’t working, even if I’ve already invested a lot of time and thread. Before, it was difficult to admit that it was time to start over, especially with the idea of frogging something - or rather the guilt of not frogging it - looming over the project. Now I almost look forward to having a lot of beadwork scraps to fuse together at the end of the year. It's a rather refreshing retreat. This week I’m way behind on a new Egyptian Gods necklace, because after giving my original idea a fair shot it didn't really deserve, I had to start over. I created a custom mix of 8/o seed beads specifically for accents in a spiral rope, mixing up the dregs of several blue, green, brown, and black packets. There are far too many colors to bother sorting them back out, so I was pretty determined to make my idea work and use up the mix. I tried switching the rope colors to get a color blocked look and see how it worked, but the fact remained that the beadwork was very…inelegant. I stewed and pondered for awhile, and finally decided on double St. Petersburg chain with stripes, which would make use of the 'river' mix and the other seed bead colors I’d chosen. The new necklace chain not only looks better, but it has a more water-inspired appearance, which is perfect. When finished, it will also include some beaded flowers and papyrus reeds in tribute to the Egyptian god of inundation. All of the components are already complete, although I may have to go back and replace the lime green papyrus with emerald - I think the color may look too cute against the opaque blues of the chain. Last week’s jewelry projects are complete - although the pendants are still waiting for their cords. I would like to keep taking these short ring and pendant breaks whenever possible, assuming that I can catch up on my gods list and leave a little room in my schedule. I’m about half way to my deadline, but still have a lot of deities to go. There are so many different ways that a bead style can become an instant favorite. Perhaps it’s the color or shape, ease of use, or the way it fits perfectly into our favorite designs. Whatever the reason, some beads just inspire love at first sight. Right now I have my heart set on a few different accents in my stash, all of them ready and waiting for the perfect project. Whenever I need a spool of Fireline, I set a little budget and go on the hunt for new bead treats to include in my order. I usually stock up on some favorite seed bead colors, and then keep my eyes open for some interesting accents to try. During my last shopping session, I decided it was time to finally give the Swarovski Elements gemstone pearl colors a shot. Luckily, Fusion Beads has their own custom mixes, and this one called Siren caught my eye. It includes dark lapis, ivory, jade, turquoise, and red coral, but I see lapis, alabaster, turquoise, blue faience, and carnelian! These should come in handy in some upcoming Egyptian designs. Awhile back I purchased some teal coconut rondelles on a whim, and ended up devouring them rather quickly. Every project I added them to seemed to turn out perfectly. Since then, I’ve had my eyes open for other lightweight heishi and rondelles, which make great accents for collars. These bone spacers from Happy Mango Beads definitely fit the bill. They’re a little larger than what I’m used to using, so I’ll have to make sure that whatever project they end up in has room for bold fringe. I’m very eager to cut the string and see what they can do. Finally, I have some neglected beads. Several months ago I purchased these three strands of gorgeous blue Czech teardrops from Shipwreck Beads to use in collars and was very excited to work with them - especially the transparent cobalt. I placed each one in the tray that I use for shaped seed beads like Tilas, peanuts, and magatams. And because I hardly ever use these types of beads, I quickly forgot all about these lovely strands. I rediscovered them recently while looking for spiral rope accents, and I’ve bumped them back up to must-use status. Do you have any new-found bead loves right now? There is nothing quite like the joy of tiny, abundant seed beads. They flow like water and weave into the most wonderful designs. 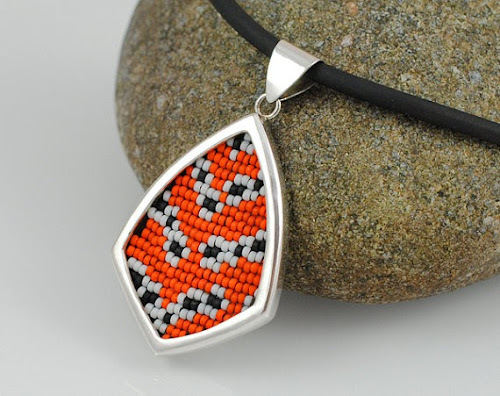 Seed beads are versatile, able to blend into almost any art form, with nearly any material. Today we’re going to pass along a little of that joy! Inspirational Beading sponsor The Best Beads has generously offered a gorgeous set of Czech seed beads and bugles for one lucky reader! 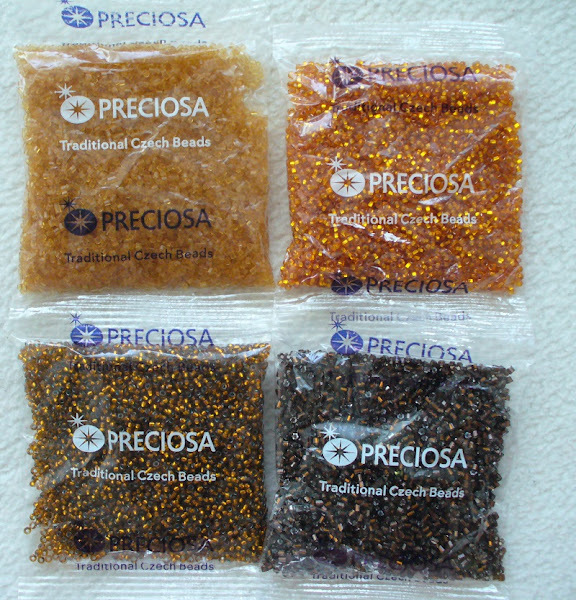 The prize includes four 50 gram packs of transparent and silver lined seed beads in gorgeous brown and golden hues, plus a surprise package! For a chance to win all of the beads shown, and some secret bonus beads, head over to The Best Beads to check out their amazing beads direct from the Czech Republic. 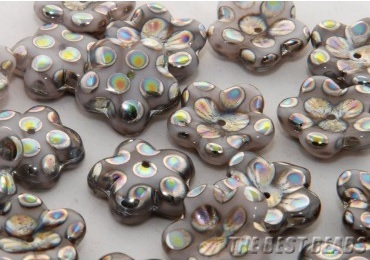 Then leave a comment on this post, letting us know which bead style from their selection is your favorite. Anything goes! One lucky reader will be chosen at random on Tuesday, June 25th. This giveaway is open to all international readers. Important: Entries must be made here on Inspirational Beading to qualify for the draw. Please make sure to include an email address or contact link in your comment, or through your profile, so that I can contact you if you win. Incomplete or anonymous entries will not be included in the draw. Update: The drawing has closed. Thanks to everyone who joined in! Often when we discover a new technique or material that we enjoy working with, it sticks. All of our ideas seem to steer towards this one concept, and the best thing is to embrace the inspiration and let it run its course. Right now, I’m hopelessly drawn to ombre. There’s something incredibly satisfying about the blending of colors with seed beads. It took a long time to finally decide on the right technique for the Egyptian god of infinity, but I was certain early on the ombre had to be included. A blending of blues and greens was the perfect way to represent the frog god of eternity. I pulled out lots of colors, mixed them and arranged them, and eventually found a pattern that would allow the colors to flow continuously while repeating through a chevron chain lariat. Some of the colors are used more than once in the pattern, while others stand out from the crowd. The fringe was another long time in the making. Originally I had wanted to use transparent lime and black, to make strands of frog spawn, but it didn’t seem to fit the rest of the design. Then I tried several different patterns and accents, all of them beginning with some Czech glass ovals in lime and turquoise Picasso. Once I had chosen some bright blue white hearts - in a pattern of threes to imitate the ovals’ spots - I still needed to figure out what I was going to do with the strands. Solid colors were too stark against the blended chevron chain, and it was clear that adding a new color wasn’t going to work. At last I decided to go with a default, and used four shades of existing blues and greens to make striped tassels. I can’t decide if I’m finished with this obsession just yet, but I certainly wouldn’t mind trying out some different ombre palettes in the near future. Something rare is happening on the bead tray this week: multiple projects. I try to make a habit of finishing one design before starting the next, as difficult as it may be - unless a piece that I’m working on is incredibly tiresome and unlikely to have a satisfying end. Right now I’ve got a bit of an assembly line thing going. First I have a new set of four medallion pendants. After gluing on the backing and setting them aside to dry, I got to work on a quick quartet of herringbone rings to pass the time. The pendants all have bead centers and some interesting color combinations. My favorite so far is the lime green with stripes, which looks so much like a caterpillar even my bead helper remarked on it. I’ll leave the final judgment until they’re all snipped and trimmed. With my first ever craft show coming up at the end of this year, I’m hoping to build up a good supply of beaded rings to bring with me. Rather than spend weeks working at nothing but rings - which would interfere with the Egyptian gods challenge, barely on schedule as it is - I’m planning to make them in small batches along the way. I started by choosing some favorite colors and mixing and matching until I got combinations that I liked. Perhaps some new pattern ideas will immerge! Last week’s ombre lariat is ready to go, and turned out fabulous. I can’t believe that I was so determined to have a continuous rope design - this is so much better. Creating successful color palettes with beads is a balancing act. Bead finishes add an extra factor that isn’t present with paint or clay - it’s a challenge that is both fun and worthwhile. When trying to match beads to a focal or accent that has many colors, things get really tricky. I’ve been mulling over a way to incorporate some pretty striped trade beads into a design with perfect balance. The beads have a very soft blue tint, with stripes of darker blue, yellow, red, and orange. The trick is to find colors - and finishes - that contrast or complement the existing ones without covering up the unique personality of these beads. I started by filling in the missing hues and trying for a rainbow effect. Bright and cheerful wisteria lined crystal goes really well with the soft blue background color. All I needed was a little green. I would have liked something equally bright, but I went with white lined peridot to match the finish. A lime or olive lined crystal would have been perfect, but I still like the Spring feel that this palette has. With two blues already on board, I tried adding a third to really highlight the bright stripes of yellow, orange, and red. Dark and moody transparent Montana sapphire was a perfect fit. Once again the final color in this trio was a tough choice. I finally decided one a strong yellow in 8/o seed beads that contrasts beautifully with the Montana blue, while also linking up with the stripes in the trade beads for a Summer palette. When in doubt, start with a neutral. For the final palette, I began with bone white seed beads. The very light beige goes really well with the soft blue, and leaves plenty of room for one more pop of color. I chose light olive green - with its earthy appeal, the red, yellow, and orange stripes look less playful and more organic. This trio is perfect for Fall. Do you like working with multicolored beads? How do you build palettes around them? When designing jewelry, or any type of artwork, we are often faced with tough decisions. When we use specific themes, sometimes we have to decide whether or not to stay true to an idea or concept, or bend it to what is more mainstream or widely accepted. For instance, way back when I first started making beaded starfish, I was confronted about the misnomer (they’re actually called sea stars) but ultimately decided to stick with the common name. This week I had a little battle over staying accurate and making something really eye catching. When I sat down to sketch out ideas for the Egyptian baboon god, I had no idea where to begin. The hamadryas baboon sacred to the Egyptians isn’t the colorful and showy primate that we know from cartoons and caricatures. They’re pretty much just brownish and fuzzy. Babi himself wasn’t offering much inspiration either. His most memorable attributes are impressive nether regions, and a taste for entrails - in other words, a little more of a challenge than I’m willing to take on at this point. Before I had really started my research on Babi and Egyptian baboons, I had been thinking of dark Montana blue and a nice shade of brown. Whenever I’m working on a less common deity, there’s always temptation to fall back on shades of lapis or turquoise blue. I decided to trust my instincts and stick with these colors. I just needed something to indicate the baboon, like a pop of color. 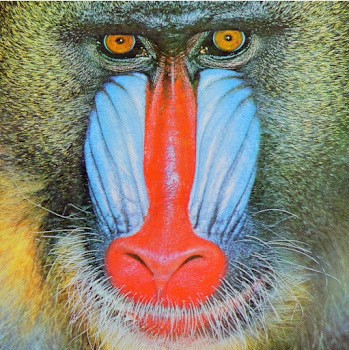 Unfortunately, the brightly colored mandrill has nothing to do with Egyptian mythology, and I was rather annoyed about it. Then I realized: I can make what I want! Not only would a combination of turquoise and red give my palette a hint of baboon-ness, but it’s a perfectly Egyptian. I added some black to my main palette, and used red and aqua white-hearts for the accents. There’s just enough color to liven up the darker shades of the collar, and the baboons will never know that I cheated. The project underway on my bead tray this week took a long time to come together. 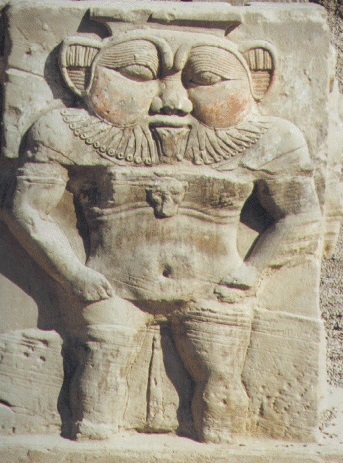 I’m finally starting to move down the alphabet of Egyptian gods; when I got to H, for some lucky reason, I decided to do a little research on the god Heh, before starting in on the Nile deity Hapi. There are so many similarities in the characteristics of these gods, and I couldn’t decide which of the ideas floating through my head to use with each deity. Both have blues and greens, and natural elements. Heh is a frog, and Hapi is made of river plants. Any of the stitches and necklace styles I was thinking of would work for both. When I thought of using a continuous ombre palette for Heh, things started to click together. 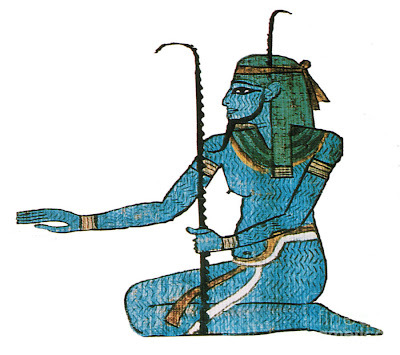 This deity is the embodiment of infinity, so a pattern of blues and greens blending endlessly together seemed perfect. At first I wanted to do a necklace with no clasp, just one continuous chain of beadwork. Netting was my first choice, but then I wouldn’t be able to connect the ends for a seamless piece. So I started with a double spiral rope, with one side a color behind the other in the pattern. It was hideous. I took the beadwork apart and tried a plain spiral rope with a repeating pattern of accents at the center of each row. Terrible. I finally had to give up on a piece that was connected end-to-end, and as soon as I did, the perfect idea came forward. A chevron chain lariat would provide the length I needed to really showcase the ombre palette, without using up outrageous amounts of each bead color. And I can finish the ends with some fun fringe. It’s taking a little longer than usual as I constantly rotate bead colors into my little cups and then replace them for the next color, but things are finally moving along. Last week’s cuff bracelet came out really well. I had a long debate about whether I wanted to do a double clasp with such a wide edge to close, but I really didn’t want to go that route. I finally decided to add some extra heavy fringe to the ends and make them a little stiffer, so that they could support a single toggle. One of the goals that I had when starting the Egyptian Gods series was to focus my designs, and cultivate a selection of pieces that had an Egyptian style. While it is difficult to mimic real Egyptian jewelry without using any metals, I’ve managed to find a sort of balance between the beadwork techniques that I like and the subjects I want to explore. Many of the Egyptian gods necklaces don’t look distinctly Egyptian, but they are starting to look very ‘me’. Whenever I come across a deity that is difficult to dissect and reassemble as a necklace, I get to fall back on a design style that is rather Egyptian - the collar. This is the direction I took for the household god Bes. He’s a rather unusual character with lots of interesting attributes, most of which don’t translate well into beadwork. I finally decided to try and mimic his beard and lion features in a collar. I chose an ombre palette of warm browns, then gathered up a selection of complementary accents. I was hoping to get an eclectic look, to represent the spirit that dances around the room to scare away demons and entertain babies. After I started stitching, I realized that the wooden beads were just to clunky for this design, so I stuck to the orange white-hearts and freshwater pearls. Many of my recent collars have been very wide, and for this piece I wanted to shrink the netting a bit, so I reduced my usual pattern by one row. The ombre effect of the beiges and browns came out perfectly, although I was a little worried at first that the opaques would clash with the transparents. I’m also relieved that I decided against the wood beads, but I’m hoping a project idea will appear for them soon. Over the past year, I’ve had a great time sharing a glimpse of my projects in progress in a Weekly Bead Tray photo on Facebook. When I started, I didn’t think that half of a herringbone cuff was all that interesting, but these snapshots always seem to spark some interesting bead talk. Therefore, I’ve decided it’s time to expand on the idea, and bring things here to the blog, where we can get a closer look at what’s going on at my workspace. This week, I’m taking a quick break from the Egyptian Gods series challenge with a simple herringbone cuff. It was one of those middle of the night ideas that couldn’t be ignored. I was in the mood for stripes, and that’s all there was to it. I knew there had to be black and white, and I wanted to contrast that with perpendicular stripes in other opaque colors. After some tasting and shuffling of different colors, I finally decided on medium blue and light olive green. As I was putting together the first two rows in a double ladder to start the bracelet, I was caught by a sudden urge to just keep adding columns and make a really wide cuff. It’s been awhile since I’ve made a bracelet that was really bold in this way, and it seemed like a great idea at the time. We’ll see how I feel about this idea after I’ve been at it for a week! Can you imagine a world without glass beads? There are a great many jewelry designers and even beaders who focus their skills on other materials, but for many of us, glass is the way to go. As an inexpensive, easy to work substance, glass is ideal for bead making, and provides us with an endless variety of beads to choose from. For every technique and style, there is a glass bead to match. In A Touch of Glass, the beauty of glass beads get undivided attention, as jewelry artist Nancy Alden takes the reader on a tour of the versatility and aesthetic value of simple jewelry. Using traditional stringing and wirework techniques, and an abundance of glass beads, Nancy has created a guide to turning a relatively inexpensive jewelry material into elegant, eye-catching designs. This is not just a guide to beading, but a tribute to glass! The book begins with a detailed history of glass beads, and a look at contemporary bead styles used in jewelry making, as well as a primer on the components needed to make the 50 projects to follow. There are a variety of simple necklaces, earrings, and bracelets to try - all of them made with glass pieces that can be found in most bead shops. There are projects for everything from lampwork beads, to Czech daggers, to trade beads, and each is more beautiful than the last. 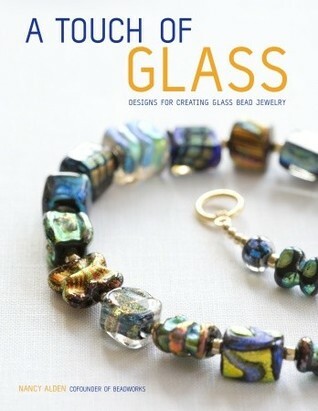 The cover design, which features dichroic glass, doesn’t even compare to some of the stunning pieces within. Each project includes a full materials list and step-by-step instructions, with a full page photograph of a finished piece. Detailed instructions for crimping, wire wrapping, and other bead basics are included at the back of the book for beginners - intermediate beaders will be able to breeze through their favorite projects and fully enjoy the beauty of the glass at work.